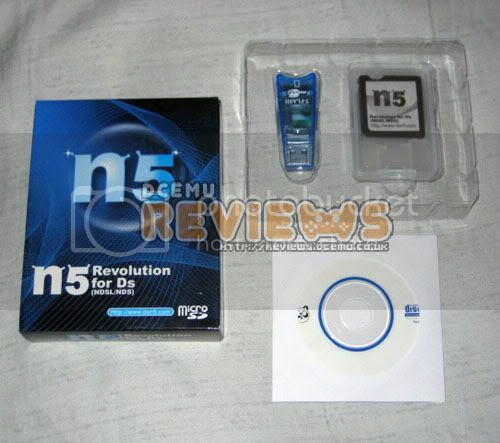 Overview : N5DS or DSN5 is a multi functional media adapter for NDS. It accepts MicroSD cards. N5DS allows use of Homebrew DS applications, multimedia (via Moonshell) and commercial NDS applications via the SD interface. N5DS is easy to use, just load the N5DS OS onto the MicroSD together with your favorite applications, plug into N5DS then insert the N5DS cartridge into the DS and you're ready to go! Quality/Usability : If you havent already heard about the N5DS/DSN5, you will probably start to hear about it more often. Its a new product...I mean clone of your most recognized flash carts on the market, R4DS R4 Revolution. N5 Revolution's website is even a copy of the R4's website. I even went as far as to contact my source at R4 and hear directly from them as to whether or not this is their product. They have confirmed that this is NOT their product. But is the N5 the same or superior than its original? Thats what we're here to find out and let you know. Like majority of flash carts on the market, they include a mini-CD with firmware files. As always, its best to download from the manufacturers homepage. Not with this product. Trying to download the latest files only gave me 1KB file instead of the ~12MB file. Since this card is new to the market and the first site to review this product, I wanted to find more information on this card and was unable to. Only information I found was from Chinese wholesalers with different box art and sticker on the N5. Some even claimed this would support microSDHC. But since this is a clone of the R4, there is no support for microSDHC. R4 hasnt even released a new product that supports microSDHC. But to give it a test, I thought I would pop in my 4GB Kingston microSDHC (Japan). I get as far as the "Loading..." screen and it just hangs. So those loyal to R4 and thinks the N5 will have SDHC support, this is not for you. Since the 4GB microSDHC is a no go, lets try a normal 1GB A-Data microSD (Japan). After transferring the necessary files and a couple of games, I turned on the DS. Wait, whats this?! Looks exactly like what happened with the 4GB microSDHC. Did I do something wrong? So I decided to try a different microSD, this time using my 1GB Kingston microSD (Japan). Copied the same exact files and turned on my DS. Loading screen showed and it went directly to the menu. It worked! So it seems that the N5DS is picky when it comes to microSDs. Whats got me stumped is that since this is a clone of the R4, isnt it suppose to work the same? I had the A-Data card on my M3 Simply and R4 and it worked but not on the N5. Weird. So once I had the microSD situation figured out, its time to test this clone out. Upon startup, you are greeted with three options; GAMES, MULTIMEDIA and BOOT SLOT-2. When GAMES is selected, the file browser is located on the top screen. This is where all your selecting is done. To navigate through files or to select a file, you use the directional pad to move up and down. Too bad that you cant use the touch pad. The menu looks exactly like the R4 with the exception of some colors and instead of R4 Revolution logo, it has N5 Revolution. logo.bmp -- Background of the Top Screen of N5's Startup. icons.bmp -- Background of the Bottom Screen of N5's Startup. bckgrd_1.bmp -- Background of the Top Screen of N5's Explorer. bckgrd_2.bmp -- Background of the Bottom Screen of N5s Explorer. Is the compatibility with games the same? The first game I tried was Castlevania: Portrait of Ruin since this had problems with certain microSDs but worked fine with my Kingston/A-Data cards. On the R4, the game ran smooth with no lag. However, on the N5 there was severe lag. Other games that I have tried on the N5 didnt seem to have any problems. Cheat database and .sav files are the same as the R4, so you'll be able to transfer your R4 .sav's to the N5. Homebrew files ran fine on the R4 Revolution and the N5 Revolution ran them fine also. Conclusion : Overall, the N5 Revolution DS N5DS Card SLOT-1 would be an acceptable temporary solution to the R4 Revolution. This would never replace the famous R4. But if you want an R4 but its sold out everywhere or no longer being carried, the N5 is more readily available and slightly cheaper as a alternative. But I wouldnt use it as my main flash cart. There are better and newer carts available on the market. They even support microSDHC. You would think that a clone would be an exact duplicate or identical in every way even in compatibility but the DSN5 falls short in some areas. For something that is a clone and outdated compared to other flash carts on the market, price should be lower. What I do like is that Colourful-Zone provides a Quality Check Program. The products that they sell is covered by their 100% Quality Check Program which means that each product has to be passed by their Quality Control Team in order to achieve 0% rate of Dead On Arrival (DOA) to all of their customers. Quality/Usability : Colourful Zone was nice enough to send us an updated version of the N5 Revolution. This version is not from N5 but has been modified by CZ's professional technical staff. The CZ version fixes known problems such as the freezing "LOADING" screen and some incompatibilities. None of the software has been modified so you can use N5's own files. Only the cartridge itself has been modified to improve on these problems. As mentioned in the review above, we had issues with our 1GB A-Data microSD. With files loaded onto the microSD and DS turned on, we were presented with the "LOADING" screen. It would not go any further. But having tried the CZ version with the same files and microSD, it solved the loading issue. What I also noticed with the CZ version was that I didnt notice any lag or stutters with games. About the CZ version, it is purely our solution on hardware only. We tried to avoid changing any part of software in order to get the highest compatibility with the latest software from N5. Also, more effort is necessary in modifying the software. Thus, we do not think changing the software is good for both customers and us. However, with this new version, CZ opted to remove the spring loaded action for the microSD. I think it was better to have the spring loaded action as it was easier to remove the microSD. Now that there is no spring to pop out the microSD, you'll have to try a little hard to get to the microSD since it sits flush with the N5, especially if you have big finger tips. Although we can use our all T-Flash memory cards which include Kingston, Toshiba, SanDisk, A-Data, Kingmax and Transcend in CZ version, we found that the speed of accessing using the first 3 brands are normal but using the last 3 brands are very slow. It is due to the limitation of the chips design in N5. Actually, there are 2 modes in accessing SD memory cards according to the SD memory card specification. All other DS cards such as R4, EDGE, DSTT, etc., as we know, are using the normal(fast) method to access the SD memory card but N5 is using the slow method to access the SD memory card. The advantage of this method is the total costs of the cards is lower but the speed is lower as well. Thus, there is no solution on it unless changing the design of N5 chips. Conclusion : Colourful Zone did a great job of improving the dreaded issues with the N5. This makes it slightly worth it to purchase now. But as mentioned above, I personally preferred the spring loaded microSD slot. To determine which version you have, CZ places a small CZ sticker on the box. They also place 3 more on the cartridge itself (front, back and top). This is overkill. You only need one; front or on top next to microSD slot. So if you're looking to get the N5, CZ is the place to get it as they have fixed the problems no thanks to N5. With the new fix by CZ, the price tag is considerably high and overpriced compared to other flash carts on the market that work, is more stable and compatible with microSDHC. If this was priced around $25-30, this may attract more attention and interest. Guests online: 515. Total online: 516.